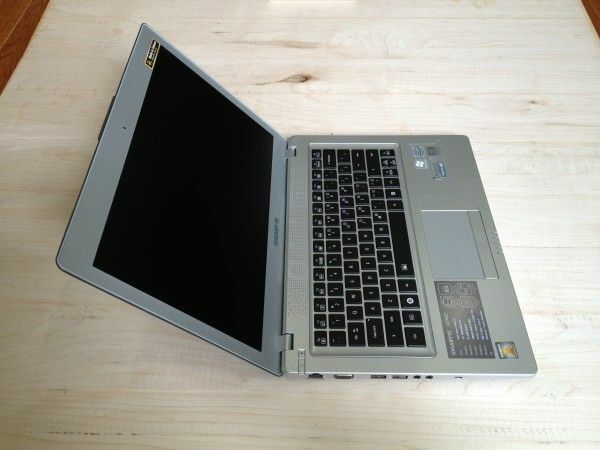 See full U2442V specs in our Ultrabook database here. In addition to the GT 640M, the third-generation Core i7 (Ivy Bridge) processor includes integrated HD4000 graphics and the U2442V will toggle between them automatically for power savings (which essentially boils down to using the GT 640M on power and HD4000 on battery), but you can manually decide which is used as well. Nvidia’s configuration also allows you to use one of the cards for video rendering and the other one for physics calculations thanks to Nvidia PhysX. The U2442 feels well built and shares some styling queues with the Lenovo U310 — the top and bottom are brushed dark-champagne aluminum while the keyboard deck and other inside surfaces are silver plastic. The keyboard is one of the best I’ve used on an Ultrabook, offering what feels like a perfect combination of key travel and feedback without being too loud. I should mention too that the keyboard is back lit which can be useful from time to time. Much respect to Gigabyte for not loading the U2442V up with bloatware. Out of the box there is little to bother you aside from some utilities down in the system tray and a few promotional shortcuts on the desktop. There are significantly less processes running on the U2442V fresh from the factory than from other Ultrabooks I’ve used. 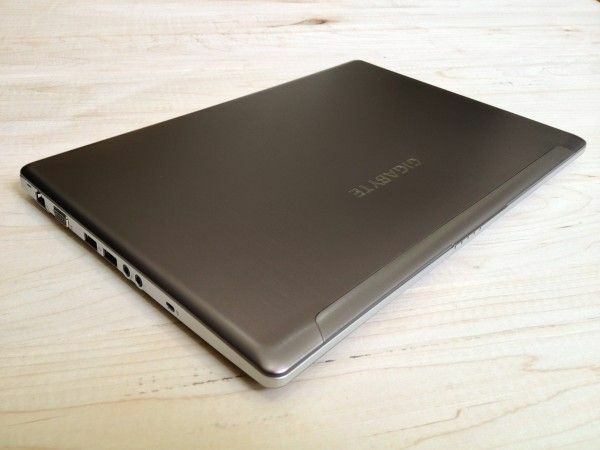 Being in the 14″ class, the Gigabyte U2442V is relatively large; it feels a bit more like a standard laptop (in terms of size) than some of the super-sleek Ultrabooks like the Asus Zenbook series. It’s clear that Gigabyte wanted to pack as much performance into this package as possible and considering everything that’s inside I’d say it remains pretty thin (just under 21mm, as per Intel’s Ultrabook specifications for 14″+ devices). It’s a bit heavier than I’d like for everyday mobile use (which is how I tend to use my computers), but if you’re looking for portable power (and gaming) that can easily go from one desk to the next the U2442V should be on your list. There’s also access to the HDD and RAM through the bottom of the unit (thank you, Gigabyte!). As for gaming, the GT 640m is the middle-high end card from Nvidia and from my limited testing thus far it performs very impressively. The card easily handled Call of Duty 4: Modern Warfare (2007) well beyond 30 FPS at maximum resolution (1600×900) and maximum settings. The same thing goes for Borderlands (2009) — full settings, 30+ FPS with ease. Neither of these games actually presented enough of a challenge for the U2442V and GT 640M so I’m in the midst of downloading more demanding games to see what it can keep up with. So far things are looking very good. We’ll have a full detailed Gigabyte U2442 review in the very near future. Stay tuned and feel free to drop any questions you might have here! I’d love to know how does the screen compare to other ultrabooks like Carbon X1 or Zenbooks? especially brightness and contrast? And how’s about the fan noise? Many people report that they’re working constantly regardless of CPU load. Is that already fixed? Looking forward full review, thx! i’ve got my u2442n a week ago. the fans are not constantly working. the weight is about 1,7kg with the hdd. by exchanging the hdd against another ssd, you could lower the weight to 1,6kg. it’s a great combination of graphic performance, weight and price. the price wasn’t my first priority, but i had some problems finding similar or better machines with 14″ and such a low weight. the keyboard and plastic body is the only thing i’m concerned about, but i can definitely live with that considering the low price. another big plus is the changeable hdd & ram. the only ultrabook i’ve found without soldered ram was the hp spectre, where you have to tear apart the whole machine to reach the ram. i didn’t expected the option to upgrade/replace damaged hdd, ram and battery for such a low price. it’s actually the point where gigabyte has dispelled all my doubts about their quality. thx for info. And how is the screen in your opinion? And you are right, there is no other 14″ on the market with comparable specs at 1.6kg. This one is unique so far. the resolution of 1600×900 was important for me. you can’t expect much from a TN panel though. i would love to get an IPS panel, but i couldn’t find one with IPS and similar specs. there is one thing gigabyte could have fixed: the led backlight of the display is shining through the bottom bezel. it’s a minor flaw which was reported in another review before, too. if you need more details, there are some detailed reviews about the display on the net. don’t know if i’m allowed to share them here. some info missing: is the keyboard backlit ? Weight ? Is the DDR3 1600 MHz or 1333 MHz?